Do you want to learn how to tie knots? There are lots of step-by-step color pictures that will aid in your knot tying adventures. 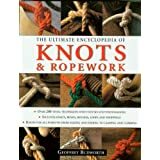 This book includes variations on the bowline, tying a knot in the middle of a rope (a bite), to making a rope mat or other ornamental (and useful) knots. Knowing how to tie a knot for any occasion will make you a useful citizen and friend.